Leading Bump Stock Manufacturer To Resume Sales Tuesday The accessories, which make assault-style rifles more deadly, drew even more controversy after they were used in the Las Vegas massacre. 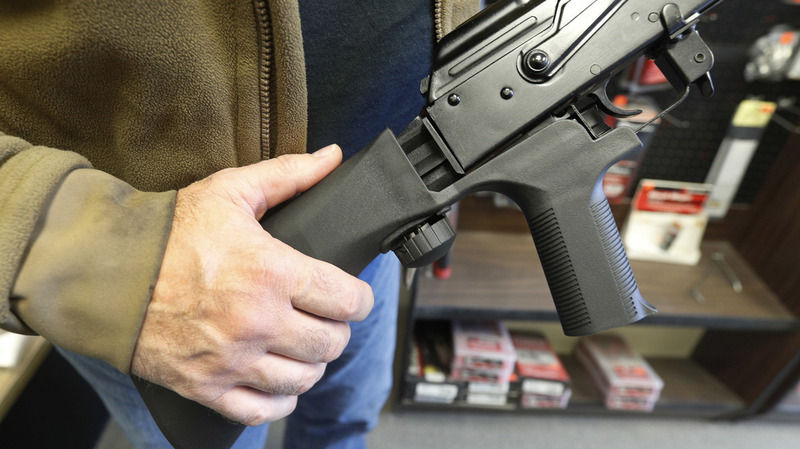 A bump stock device is shown on a semi-automatic rifle at a gun store in Salt Lake City. One of America's leading and most controversial gun-accessory makers says it will resume sales Tuesday of a device known as a "bump stock." Bump stocks dramatically accelerate the rate-of-fire of semi-automatic rifles, allowing them to shoot almost as fast as fully-automatic machine guns, which are far more tightly regulated and expensive in the U.S.
Slide Fire, a company based in Moran, Texas, suspended sales of its bump stock line of products in early October. The decision came after it was revealed that Las Vegas shooter Stephen Paddock used similar devices when he sprayed a crowd of concert-goers with bullets, leaving 58 people dead. "We have temporarily suspended accepting new orders while we work to replenish inventory," the company said on its website at the time. Bump stocks work by causing the firearm to bounce rapidly against the shooter's trigger finger. In a notice to customers emailed Monday, Slide Fire said that it will once again begin accepting orders for "limited sales of several products." The company lists a variety of bump stocks that are currently available, many of them designed for use with AR-15 rifles. That's the weapon used by Paddock in Las Vegas and more recently by Devin Patrick Kelley, who on Sunday killed 26 people at a church in Sutherland Springs, Texas. The founder of Slide Fire, Jeremiah Cottle, hasn't responded to NPR's requests for comment. He has also declined interview requests from other news organizations. In recent weeks, bump stocks have become so controversial that even the National Rifle Association – which typically opposes most gun regulation – signaled that it wouldn't oppose new controls on the devices. Some Republican lawmakers also indicated discomfort with bump stocks, trigger cranks, and other accessories designed to accelerate the rate of fire for handguns and rifles. "We think the regulatory fix is the smartest, quickest fix," House Speaker Paul Ryan, R-Wis., said in October during a news conference. "We are still trying to assess why ATF let this go through in the first place." Despite the fact that bump stocks appear to skirt the country's tight rules governing fully-automatic firearms, the federal Bureau of Alcohol, Tobacco, Firearms and Explosives issued a formal letter approving their sale. Following the mass-shooting in Las Vegas, Democratic Sen. Dianne Feinstein introduced legislation that would ban all similar devices. After garnering some early bipartisan support, that gun control measure appears to have stalled. Despite its decision to temporarily halt sales of its products, Slide Fire has never backed away from the argument that bump stocks are a legal and legitimate accessory. On its website, the company markets the devices as a symbol of freedom from firearm regulation, describing those who purchase the devices as "patriots."